Tapioca isn't as popular as rice pudding. My guess is due to the fact that preparation and cooking time goes on forever (2 days). First, the tapioca pearls must be soaked overnight, like beans. Unlike beans, you can't buy canned tapioca pearls, just the dried stuff. You can buy canned tapioca pudding, but it tastes like canned tapioca pudding. Before you say, "Hey, 'they' sell small pearl tapioca," that's exactly what I use (gee, the larger pearls must take a week to soak). "But how 'bout the instant stuff?" you retort helpfully. Yes, that would speed up the process, but I like how cute those little pearl balls look, suspended in the custard, like the bubbles in cheap hair gel. When I am able to carve out a huge block of time, I make tapioca. Usually that happens every other decade. This is the decade! Yay! And yum! I've been making this recipe for so many years that I no longer recall where I first stumbled upon it (it might have been Apartment Life). It's a fall-back recipe with few ingredients and less instructions. Basically, one pot to cook up the pasta and one skillet where all the rest of the ingredients are tossed. I prefer to use thin spaghetti (spaghettini), but regular ol' spaghetti or even linguine will substitute nicely. Likewise, if you don't have chicken broth on hand, use veggie broth. And if you do, please wash before continuing. Don't skip the step about pounding the breasts. It only adds a couple of minutes to the recipe, but really makes a difference. Pounding tenderizes the meat and allows it to cook evenly. Plus it's fun and lets out your aggressions. Just don't get too aggressive, or the chicken will be pulverized. Despite the oven frying, this recipe makes for some juicy and tender chicken. It is VERY juicy. Like an orange, the juices from this chicken will run down your face it's so juicy. And ten-DER! So tender you'll plotz! "This chicken is so juicy and tender!" I gushed to theHubby as we were devouring dinner. "Just nice? But this is THE most tenderest and juiciest chicken I ever made!" "It's okay. I just like it a little drier." Anyway, if you are a more normal person who likes chicken, you HAVE to try this. 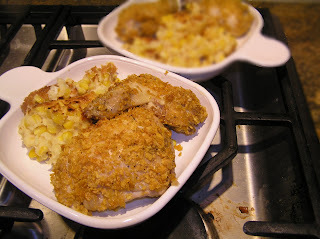 For many years I've seen in article after article that soaking a chicken in buttermilk makes for a great fried chicken. But for obvious (read: kosher) reasons, in my house buttermilk and chicken don't mix. This is the first in my irregular series of Thanksgiving dishes. The recipe was sitting patiently in my folder, waiting for the right moment to spring upon my unsuspecting family test prior to Thanksgiving. I was in the process of preparing oven-fried chicken (recipe to be posted tomorrow), when I realized that I needed a non-potato side-dish. No strange and exotic reason. I even had both potatoes and those of the instant persuasion in my possession. Just wasn't in the mood for potato. Suddenly, it became The Right Moment. Yum! Another veggie to grace my Thanksgiving table! By the way, Cujo took a self-guided tour of the neighborhood this afternoon. Luckily, a friendly neighbor helped capture him. Bad dog, no photo today.